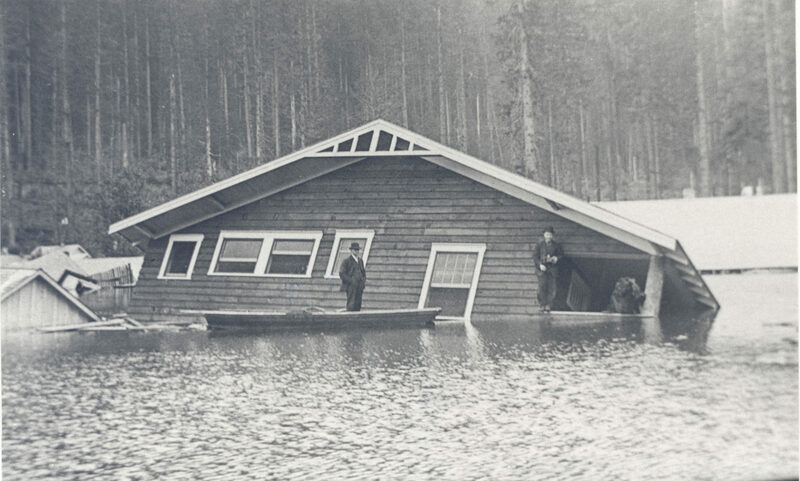 The Snoqualmie Valley is no stranger to flooding. During the months of October to March, residents up and down the Valley hold their breath and watch the forecast hoping the waters will stay down. When floods do come, everyone jumps into action, moving farm equipment and animals to high ground and finding road reroutes to stay away from the dangerous flow. Then the waters retreat, damage is assessed, and life more or less goes back to normal. In 1915, life did not go back to normal. Residents of the town of Moncton, just outside North Bend, started noticing waters rising that spring, edging closer to their homes, and then into their homes. Over the course of the summer almost the entire community was underwater. Their town had become a lake, and has remained a lake—the flooding never receded. Moncton was founded in 1906 on the wide Rattlesnake Prairie just south of North Bend. The town was established on the Chicago, Milwaukee & St. Paul Railway line shortly after the railway was built. The railway was needed to provide access for the water department workers and their families who lived in nearby Cedar Falls, a half mile to the south. Moncton, named after one of its settlers, was often referred as Cedar Falls by the City. Unlike the company town of Cedar Falls however, residents in Moncton could own their own home, making it more desirable. By 1915, more than 200 people lived there and the town included a hotel, a barbershop, a saloon, a restaurant, a few stores, and even an indoor swimming pool. A school on the north end of town provided education for children up through 8th grade. Older students had to walk or ride a horse seven miles to the nearest high school in North Bend. 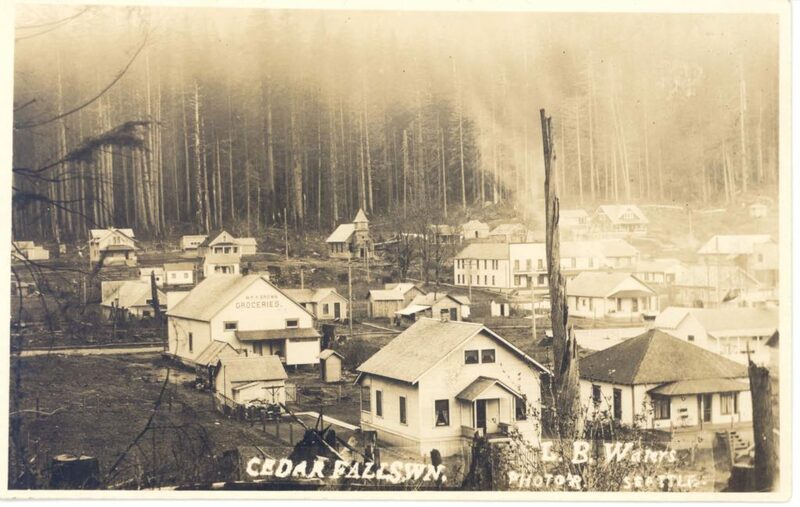 The City of Seattle had first set its sights on the Cedar Falls area in the late 1800s to provide water for its growing population. In 1900, a dam named Landsburg was constructed on the Cedar River and in 1901 the first water was delivered to Seattle via gravity lines. From the Landsburg dam a pipeline ran 13.5 miles to Renton, then a slightly narrower pipeline carried the water to Seattle. In addition to water, the City of Seattle believed that the Cedar River could also provide electricity and an engineer named R.H. Thomson worked to make that a reality. A timber crib dam was constructed upstream of the Landsburg dam on the Chester Morse Lake, raising the level of the lake 18 feet, and a power plant was constructed in the town of Cedar Falls in 1902. The first electricity was delivered to Seattle in 1905. 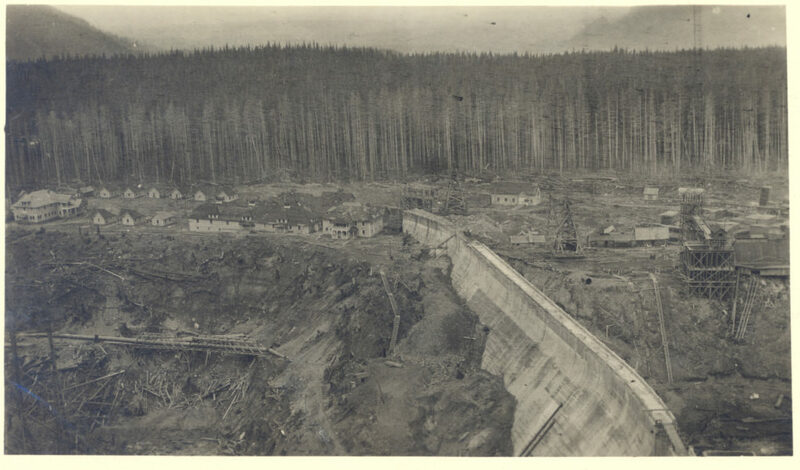 To increase storage capacity, construction on a new dam was started 1910. This dam, named the Masonry Dam, was located 1.5 miles below the crib dam, and was made of stone and brick rather than wood. Construction of this dam was done against the advice of the consulting engineers, who said that the soil in the area was not suitable. 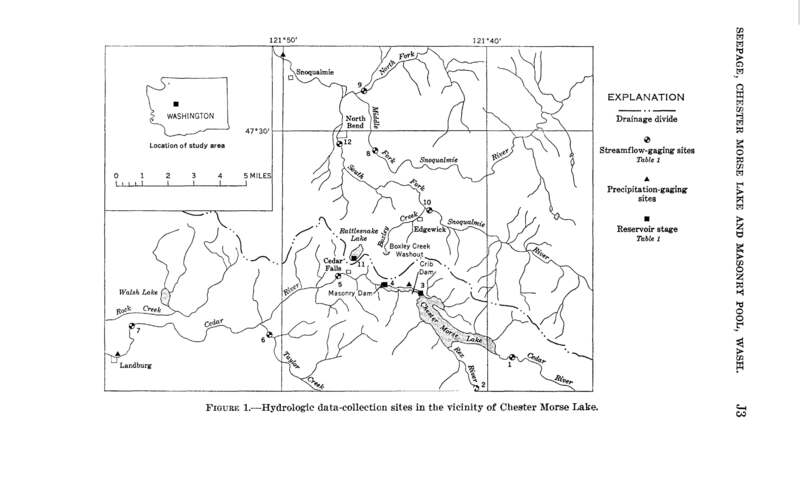 The area is underlain by a glacial moraine, which is unconsolidated debris left when the glaciers retreated. In spite of concerns, the dam was built and water storage behind it began in December 1914. Within just a few months, seepage began. 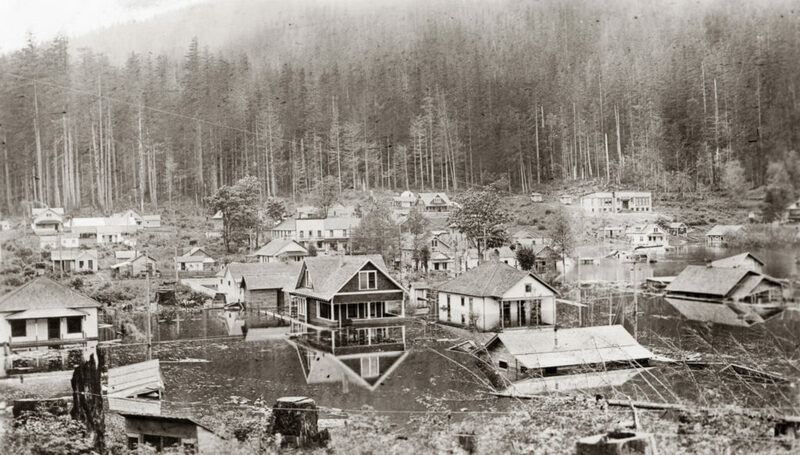 In April 1915 water began pouring in from the hills near the dam. Residents could see springs bursting out of the hillside; as more water filled the reservoir behind the dam and more rain fell from the skies, water continued to pour through the hills above Moncton and then down into the town. Slowly, the prairie filled with water. Water began to edge close to home and with in a few days the streets began to fill. Residents initially hoped that the slow flooding would be diverted elsewhere, but it soon became apparent that Moncton would be underwater by summer’s end. During the month of May, water rose a little over a foot per day. Rowboats and a barge were floated in so furnishings and personal items could be removed. Water levels kept increasing to the point where houses popped off their foundations, causing them to float out into the middle of what was now officially a lake. Moncton residents remained hopeful. Those who worked for the water department or the railroad were sheltered in tents while new homes were built for them, but others were out of luck. Worried that the wreckage-strewn lake would next seep into the watershed, the City of Seattle condemned the town of Moncton. A total of $47,658.03 was paid to residents for their land. 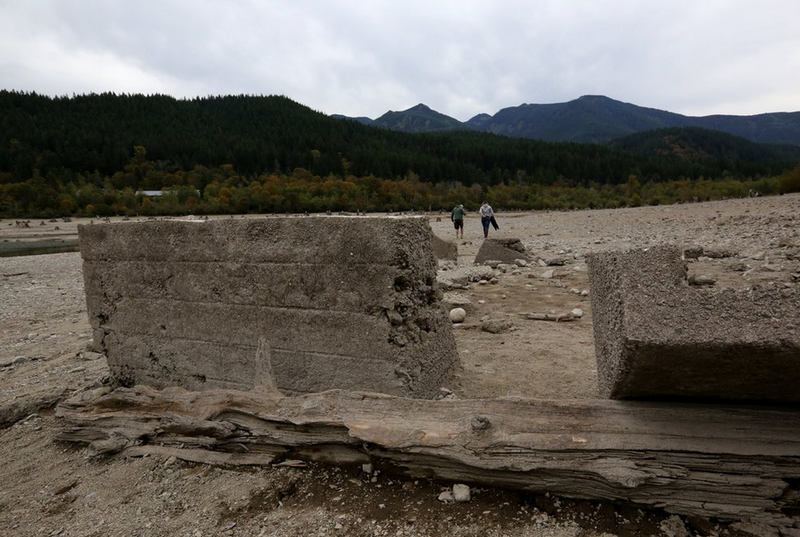 The next year, water levels receded enough for Seattle City Light to finish off the town. A crew of workers was dispatched to tear down the waterlogged homes. A few were salvageable and purchased by nearby residents and relocated to higher ground. The rest were torn apart and burned. 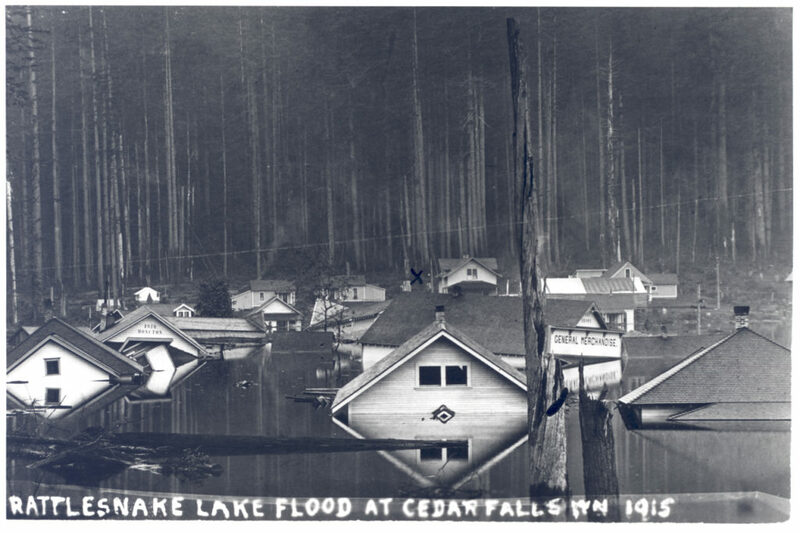 For a long time afterwards, Cedar Falls residents were not allowed to swim in the lake for fear of further contamination of the water supply. Rattlesnake Lake, named after the Rattlesnake Prairie it took over, slowly became known as a local recreation destination. 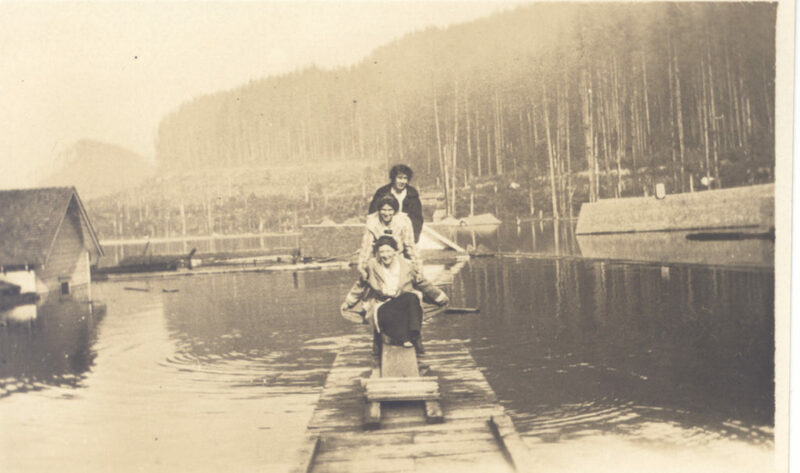 In 1970, Rattlesnake Lake Recreation Area was created, and the lake is now used for boating, fishing, and swimming. Today you can still see evidence of Moncton, especially in a dry year, when can see the bottom of Rattlesnake Lake and still find the foundations of this short-lived town.